Des moines, IA - Republican Ted Cruz had a slight advantage over Donald Trump while Democrat Hillary Clinton held a small lead over rival Bernie Sanders on Monday in Iowa’s presidential nominating contest, the first in the 2016 race for the White House. Cruz, a conservative U.S. senator from Texas, led the billionaire businessman 29 percent to 25.6 percent with 44 percent of the precincts reporting results in the Midwestern U.S. state. Clinton, a former secretary of state, held a lead of 50.8 percent compared to 48.6 percent for Sanders, a self-styled democratic socialist U.S. senator from Vermont, with 64 percent of the precincts reporting. Iowans began choosing candidates at 7 p.m. CST (0100 GMT on Tuesday) in the first state-by-state battle to pick nominees for the Nov. 8 election to succeed President Barack Obama. Republican voter turnout far exceeded the normal average from previous years. 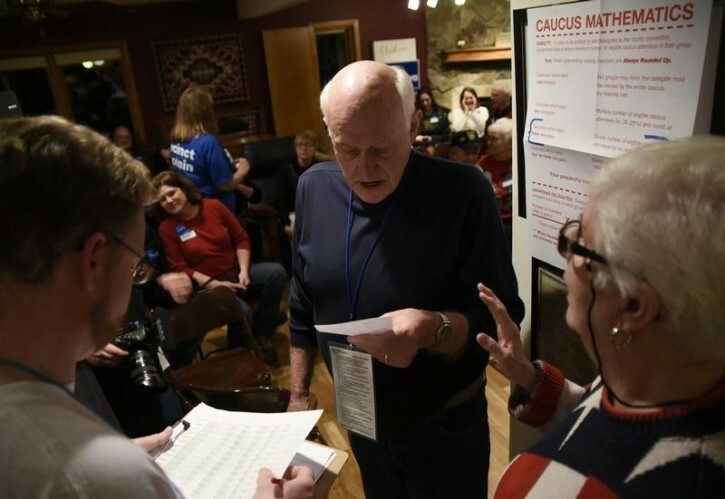 Long lines were reported at many caucus sites with many new voter registrations. “They say the record crowds are good for us so we’ll see what happens,” Trump said, acknowledging he was “a little bit” nervous. A Cruz win would upset momentum for Trump, who is leading in national polls for the Republican nomination. “We can and we will get back to the founding principles that made America great,” Cruz said on Twitter. A win for Trump could validate a campaign that has alarmed the Republican establishment, dwarfed the efforts of many seasoned politicians and been marked by controversies such as his calls for a temporary ban on Muslims entering the United States and for a wall along the Mexican border. On the Republican side, opinion polls show foreign policy hawk Marco Rubio, a U.S. senator from Florida, might win third place in Iowa and stake a claim as the best hope for the party’s mainstream. He was in third with 20.7 percent. For the Democrats, Clinton needs a win in Iowa to prevent a potential two-state opening losing streak that would raise fresh questions about a candidate who was considered the clear front-runner just two months ago. Sanders is leading in polls in New Hampshire, the next state to hold a nominating contest. Clinton began her day at her campaign’s south Des Moines field office, where she served roughly 60 volunteers donuts and coffee. An extensive ground operation, much like Obama’s as a candidate, has been cited as one of her advantages. A former U.S. senator and first lady, Clinton often touts her years of experience in politics, and says she will defend much of Obama’s legacy. Sanders has attacked from the left and promised to do more than Clinton to help American workers. Sanders said he was pleased with his performance. “We’re very proud of the campaign we ran,” he told CNN. Trump is tonight's loser as is Bush and Trump doesn't like losers. When was the last time the winner of Iowa won their parties nomination?